Remember when cell phones were the size of a small dog? As time went on, cell phones got smaller while also dramatically increasing the number of tasks they can do. Likewise, the AV industry is continually changing. One thing we’ve noticed is equipment that once required 4U of rack space moved to 2U, then 1U. That one piece of equipment may also be able to perform multiple tasks like switching, camera control and graphics mixing. The result of this movement to more capabilities with less space is the movement away from large AV racks. Products are now moving closer to the space where they are used. All along, Chief has been working to provide solutions that meet these changing realities. After several years with the PAC525 and PAC526 adjustable depth in wall storage boxes, Chief has just added an extra-large option to better help manage space behind large displays. Not only is it larger (designed for most 55" and larger displays), it helps organize that space. A multi-level, multi-sectioned backplane with universal mounting slots makes it easier to arrange components in the space available in all three dimensions. For instance, installers can hide power bricks behind the backplane with equipment mounted to the front. This also helps installers work around difficult port locations on AV equipment. The backplane can even be arranged with components before getting to the worksite. Other new options for storage hide components without having to open up the wall. 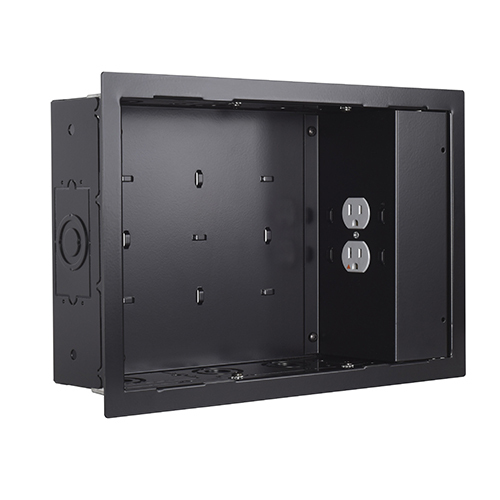 The CSPR Component Storage Panel has more than 160 square inches of secure attachment area for AV equipment on the wall behind the mount. A handle provides easier access without removing the display. The CSPH Under-Table Component Storage Panel has over 350 square inches of secure attachment area for installing equipment under conference room tables and desks. It hinges to 90 degrees for ease of access to components. It can also be broken into thirds in case less space required. Both the CSPR and CSPH are ideal for standardizing the deployment of AV component configuration across large rollouts. For hiding equipment in ceilings, Chief has plenum rated ceiling storage boxes. Chief’s CMS491 and CMS492 above ceiling boxes can be ordered with or without a column drop. They hold 100 lbs of equipment, including 50 lbs for a projector. 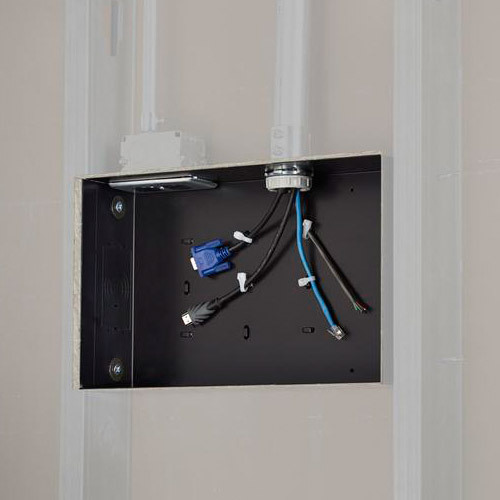 AV components can be loaded to the shelf before bringing it to the ceiling for further installation convenience. The boxes include an industry-first drop-down feature that lowers the entire frame enough to slide the tile out of the way. “The ceiling boxes are easy to work with on site and allow installers to better place projectors and equipment,” said Luke Westin, Product Manager. Even with all the alternatives, sometimes just a simple rack needed, but it doesn’t need to be big. In that case, Chief’s S2 Series racks are the most versatile. They come in 15U and 20U sizes and can be stacked, wall mounted, or added to furniture solutions. They assemble with four bolts in less than 10 minutes, saving time and space both in the truck and on the site. Their smaller size makes them easier to hide in a cabinet as well. As AV equipment continues to change, Chief will continue to listen to your feedback to determine the best way to adapt storage to fit installation needs. We look forward to hearing from you.